Radlines (at radlines.org) is an online source for radiologists. It is an international, non-profit, open access, ad-free, MediaWiki-based online source that is editable by doctors, as well as selected administrators, while everyone is welcome to leave comments and suggestions at talk pages. The mission of Radlines is to gather the most relevant information in radiology and make it quickly accessible on the Internet free of charge, without ads, in perpetuity. This will be reviewed by the board, and will generally be approved within an hour during European daytime for radiologist or a radiology trainee with a Doctor of Medicine degree. It does not require attaching any credentials such as a medical diploma. Yet, all edits made by the user are tracked in the MediaWiki software, and upon any irregular behavior, an investigation will be performed wherein the user may be requested to provide identification and credentials to the board. Failure to provide those items may result in that edits made by that user will be reverted. Thus, the activity of an editor is the main "job interview" in order to contribute. A possible adverse effect of this system is that the board may not know for certain whether an editor is actually a doctor or not, as long as she/he claims to be a doctor and edits like one. Yet, the quality of the content is thereby practically the same. An Editor may still use an anonymous username, but real names must be used in the author lists at the top of articles, see Radlines:Authorship. Radlines may cooperate with other radiology-related organizations such as societies and hospitals, but is not directly affiliated with any such organization. Rather, it forms a community where individual doctors from all over the world can participate, regardless of memberships or affiliations with other organizations. Radiologists should thereby be able to find an article about the type of image they have at hand through as little as 2 clicks, with no need to login, and no distracting ads. Radlines is in most ways a non-profit and ad-free alternative to Radiopaedia, which is currently the most comprehensive wiki-based reference work in radiology. Radiopaedia is a "business" owned by Investling.com, making profit by advertising and paid subscription. Radlines, on the other hand, is able to run on donations and volunteer time alone. Radiopaedia started out in the same (but older versioned) WikiMedia system before switching to a separate platform, but MediaWiki has since evolved substantially, including support for scrollable stacks to display for example CT scans, and VisualEditor for editing without needing to learn wiki coding. wikiradiography.net is a free website for radiographers, sonographers and students of those professions, rather than radiologists. Wikipedia is a general encyclopedia that does contain extensive information in radiology, but does not focus on presenting the information in an optimally concise way for radiologists in the course of their work. Otherwise, Radlines shares Wikipedia's feature of having most images uploaded to the shared database Wikimedia Commons  (see also Radlines:Upload), making such images readily available for both Radlines and other online sources. Radlines is currently the only member wiki of Prowikis, which is a non-profit organization aimed at the creation and technical maintenance of profession-specific wikis. Radlines (then named Radviser) on the day of its creation on April 10, 2018. Radlines was created April 10, 2018 by Mikael Häggström, who is a radiology resident in Sweden, a frequent Wikipedia editor (Wikipedia presentation), and also creator and editor-in-chief of WikiJournal of Medicine. The project was started as "Radviser" on Miraheze, a free MediaWiki host, but moved to Civihosting servers on May 13. It was renamed to "Radlines" on May 23, 2018. ↑ . Our Businesses. Investling.com. Retrieved on 2018-05-14. 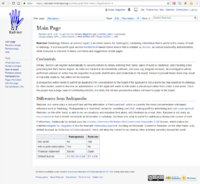 This page was last edited on 7 March 2019, at 18:51.